After you’ve added and organized any cities you want to have in iPhone Weather, tap a city to return to the weather screen. 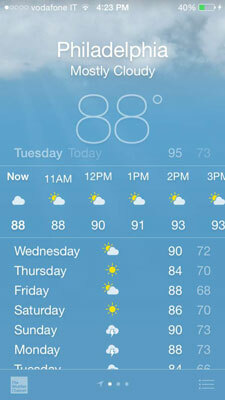 Each city on your list has its own weather forecast screen. Flick left or right to move between screens. If you have Location Services on for the Weather app (in the Settings app, tap Privacy, and tap Location Services), the first screen shows the forecast for your current location. The white dots at the bottom of the screen tell you how many cities you have forecasts for. Notice that the Location Services icon appears to the left of the dots. The dynamic background reflects the current weather, so you may see the Milky Way with an occasional shooting star or cumulus clouds drifting across a blue sky. Under the city name you see the current temperature and conditions. The day’s hourly forecast, including sunrise and sunset times, runs horizontally across the middle of the screen and below that a list of the next nine-days’ forecast with the weather symbols you’re used to: sunny, cloudy, thunderstorms, and so on. Scroll down to see weather values including humidity, wind, and a UV index, among others. Swipe the hourly forecast left to see the conditions for later in the day. When you pull down the Notification Center, you’ll see the local forecast. Tap on the forecast in the Notification Center and the Weather app opens. If you want more information, tap the Weather Channel button in the bottom-left corner. This opens Weather.com in Safari and gives you more detailed weather information along with links to websites with news and other information about that city.